Pressure Cooker Chunky Potato Cheese Soup is loaded with flavor and it’s ready to eat in just minutes when you use the pressure cooker or Instant Pot. And Potato Soup is a perfect easy dinner on one of those cool spring nights when you haven’t planned ahead! Click here to see The BEST Instant Pot Potato Soup Recipes! Click here to see The BEST Slow Cooker Potato Soup Recipes! I know, it’s spring and you want the weather to be warm! But unfortunately there are still a lot more cool evenings ahead for at least a few more months. That’s when an easy and tasty Instant Pot Soup like this Pressure Cooker Chunky Potato Cheese Soup from Pressure Cooking Today is going to sound like a perfect idea for dinner! 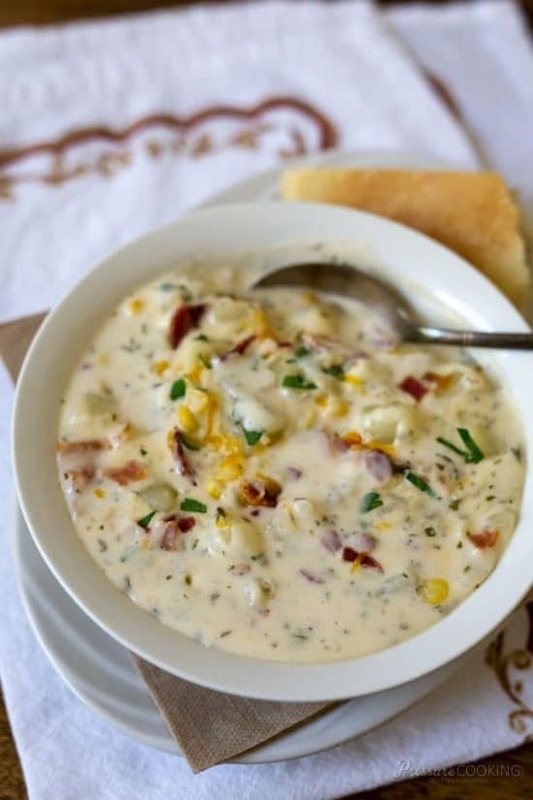 This tasty pressure cooker potato soup is loaded with chunky potatoes, bacon, corn, and two kinds of cheese and cooks in minutes in the pressure cooker. And it uses ordinary ingredients you probably keep on hand! We bet this is going to be a favorite at your house, so we’re featuring it as one of our Friday Favorites posts where we spotlight the Instant Pot or Slow Cooker recipes we think you’ll want to make over and over! Barbara cooks the potatoes in a steamer basket on top of the onions, broth, and spices so the potatoes don’t break down during cooking. This way of cooking creates a smooth and creamy soup with firm chunks of potatoes. Sounds delicious don’t you think? Get the complete recipe for Pressure Cooker Chunky Potato Cheese Soup from Pressure Cooking Today. Check out the Top 20 Vegetarian and Vegan Slow Cooker Soup Recipes.